Get ready to (pool) party. Starting at 6 p.m. PT/9 p.m. ET on Saturday, June 28, Jennifer Lopez, Iggy Azalea, Lil Jon, Tiësto, Neon Trees, Magic!, Nick Cannon, and Ariana Grande will take the stage at Miami’s Fontainebleau hotel for iHeartRadio’s Ultimate Pool Party. Can’t make it to Florida? Click HERE to stream the poolside show from the comfort of your own computer! Naming a Band, Animal-Style: According to a 2012 Savannah Now interview, a string of neon palm tree lights at his local high school In-N-Out hangout had Neon Trees frontman Tyler Glenn’s friends joking about “Neon Palm Trees” being a good name for an ’80s pop band. Fast-forward a few months later when Glenn was forming his own band, and the name emerged as a strong contender. Then it just got eerie when he found out that the dad of his newest bandmate, bassist Branden Campbell, actually installed neon lights — including the ones at their go-to burger place. “He installed those very ones we saw!” Glenn enthused. “That was when it felt less silly and more written in the stars or something.” By the way, Neon Trees’ first big hit was “Animal.” Coincidence? 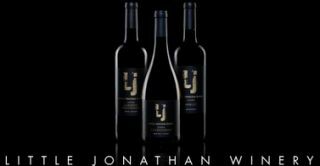 In 2008, rapper Lil’ Jon launched a label called Little Jonathan Winery, produced by winemaker Alison Crowe and featuring assorted varietals such as chardonnay, merlot and dessert wines. Raymond Burr, Yao Ming, and Francis Ford Coppola and lent his name to Little Jonathan Winery, a Laguna Hills, Calif., winery overseen by winemaker Alison Crowe. “I’m not no ‘drink wine every day’ kind of dude,” he told AP at the time. “I’m not like an expert, so don’t ask me no questions .. I just like the taste.” The label amounted to 15,000 cases of Cabernet Sauvignon Paso Robles 2006, Chardonnay Central Coast 2006, and Merlot Monterey 2005. Despite being rated 84 points, LJ didn’t produce much after that. He’s still juicing with Crunk!!! Energy Drink (containing ashwanganda, aka horny goat weed). Ariana Grande and Iggy Azalea’s track Problem hit the charts. A “Fancy” Accomplishment: As if it weren’t impressive enough for a young Australian to break into the American rap scene, in May of this year Iggy Azalea matched a record first established by the Beatles in 1964, by occupying the singles chart’s No. 1 and 2 slots. Of course, the Fab Four actually had a chokehold on the top five, with “Can’t Buy Me Love” and “Twist and Shout” at the lead. And, strictly speaking, while Azalea’s”Fancy” was a chart-topper, her No. 2 hit wasn’t a solo but a guest spot on Ariana Grande’s “Problem.” Still, a record’s a record, although Azalea’s glib reaction was “I’d rather be the Rolling Stones.” The feat has been accomplished about 15 times, but the 24-year-old Aussie immigrant is only the third woman to pull double-duty (after Mariah Carey and Ashanti). The Secret’s Out: The latest album from Tiësto, A Town Called Paradise, is all Vegas. Well, not all: The song “Calling on Angels” was inspired by some Victoria’s Secret runway action on the other side of the country. “I was at the show here in New York, and it was just mind-blowing to see all these beautiful women,” he raved to Radio.com. “If you want to go out at night, who do you want to call? You want to call some girls to bring out, right? 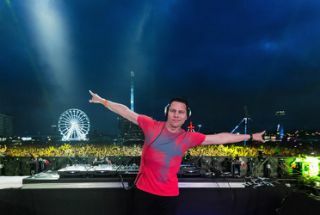 So that’s how the song got inspired.” By the way, 45-year-old Tiësto, born Tijs Michiel Verwest, may be Dutch, but his stage name comes from an Italian variation of his own childhood nickname. Happy birthday, Valentine: Seems like only yesterday that Ariana Grande, who turned 21 on June 26, was little Cat Valentine on the Nickelodeon sitcom Victorious and later Sam & Cat. She’s all grown up now, but for her big birthday, Grande nixed the barhopping rite-of-passage favored by most 21-year-olds and instead headed to Disneyworld for rides, a bonding moment with Mickey, and a four-tiered cake with a princess and Prince Charming. Dolling It Up: Besides being entertainers, what do Cher, Jennifer Lopez, and Diana Ross have in common? They’ve all had plastic replicas made of themselves by the fine artists at Mattel. J.Lo was commemorated not once but twice in 2013, both times in Zuhair Murad. But no, that green Versace dress from the Grammy Awards isn’t going to be commemorated in ABS plastic anytime soon.